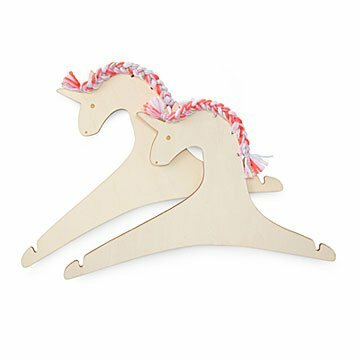 Your child's closet get a mythical upgrade with this set of two unicorn clothes hangers. The poet Pliny wrote, "The unicorn is the fiercest animal, and it is said that it is impossible to capture one alive." But did he think to check the closet? Featuring a flowing pink mane, enchanted horn, and sweet expression, these wooden hangers take storing clothes from household chore to mythical adventure. Set of two. Made in China.